Oliver Cromwell (April 25, 1599 – September 3, 1658) was an English military leader and politician. After leading the overthrow of the British monarchy, he ruled England, Scotland, and Ireland as Lord Protector from December 16, 1653 until his death almost five years later, which is believed to have been due either to malaria or poisoning. He was born in Huntingdon, Cambridgeshire. He matriculated at Sidney Sussex College, Cambridge, which was then a recently founded college with a strong Puritan ethos. Cromwell left without taking a degree, probably due to the death of his father. He was appointed Justice of the Peace, the local magistrate. Cromwell was a religious man, and had a profound sense of divine destiny, having had a conversion experience at the age of 27. As a magistrate, he would round up men who were drinking in bars and compel them to sing hymns. A puritan, he disliked the ritual and ceremonies and decorations of the established church, objected to the authority of bishops and of the King in religious affairs, but supported a state church along Presbyterian or Congregational lines. Religious freedom was an important plank in his portfolio of beliefs, although he did not tolerate Catholics. In 1656 he officially allowed Jews to re-settle in England. When the Zionist Organization petitioned the post World War I Paris Peace Conference in 1919 for a homeland in Palestine, it specifically requested that this task should be mandated to Britain because of “the peculiar relationship of England to the Palestinian problem” and because “the return of the Jews to Zion has not only been a remarkable feature in English literature, but in the domain of statecraft it has played its part, beginning with the readmission of the Jews under Cromwell” . Some scholars suggest that Cromwell thought that the New Jerusalem might be established on British soil. Some trace British Zionism, belief that the British nation has succeeded the Jewish people as God's chosen race, from Cromwell. Cromwell was a quiet and sober man, yet he commanded respect from those who served him and created a disciplined army that defeated the royalists in the English Civil War. Cromwell agonized over executing the king but believed that when the magistrate such was the King, in his view broke faith or the covenant with the people, the king may be deposed. This covenantal concept of authority, which owes something to John Calvin was hugely influential in the founding documents of the United States of America. Although disappointed, a Parliament of Lords and landowners was no more sympathetic to the poor than the king had been. Cromwell is properly credited with laying the foundation for Parliamentary democracy. Cromwell did commit excesses in his zeal for 'purity,' especially in his opposition to Catholic Ireland, where it is said that the destruction of any ruined old building is still blamed on Cromwell. In 1999, Catholics snubbed the 400th anniversary of his birth. After the massacre of men, women and children at Drogheda in September 1649, he said that it was the righteousness punishment of God. However, in terms of Cromwell's legacy, his re-admission of the Jews, his religious tolerance (albeit limited), and his opposition to authoritarian rule laid essential foundations on which modern British and North American democracy has been built, and replicated elsewhere in the world as a result of Britain's influence. It is not unfitting that his statue is prominent outside what some call the mother of parliaments. Oliver Cromwell descended from Catherine Cromwell (born c. 1483), an older sister of Tudor statesman Thomas Cromwell. Catherine was married to Morgan ap Williams, son of William ap Yevan and Joan Tudor. There is speculation that Joan was an illegitimate daughter of Jasper Tudor, 1st Duke of Bedford. Although Catherine married, her children kept her name, possibly to maintain their connection with their famous uncle. The family line continued through Richard Cromwell (c. 1500–1544), Henry Cromwell (c. 1524–January 6 1603), then to Oliver's father Robert Cromwell, Esquire (c. 1560–1617), who married Elizabeth Steward or Stewart (564–1654) on April 25, 1599, the day she delivered him a son. Both Edmund and Jasper Tudor were sons of Owen Tudor and Catherine of Valois, daughter of Charles VI of France and Isabeau of Bavaria. Catherine was also widow of Henry V of England. Her mother Isabeau was the daughter of Stephan III, Duke of Bavaria-Ingolstadt and Thadea Visconti. Fraser (2001) says that Cromwell's own relationship with his family, his wife and children. “His attitude to his children,” writes Lady Fraser, is “notably appealing not so much because it is so perfect as because it is so human.” He enjoyed and cultivated friendship, showed 'courtesy to women, and was prepared to include them in his friendships' (701). Having decided against following an uncle to Virginia, he instead became the Member of Parliament for Huntingdon in the Parliament of 1628–1629. His maiden speech was the defense of a radical democrat who had argued in an unauthorized pamphlet in favor of giving the vote to all men. He was also prominent in defending the people of The Fens from wealthy landowners who wanted to drive them off their land. Cromwell's understanding of religion and politics were very closely intertwined. He was a committed Puritan Protestant, believing that salvation was open to all who obeyed the teachings of the Bible and acted according to their own conscience. He was passionately opposed to the Roman Catholic Church, which he saw as denying the primacy of the Bible in favor of Papal and Clerical authority and which he blamed for tyranny and persecution of Protestants in Europe. For this reason, he was bitterly opposed to Charles I's reforms of the Church of England, which introduced Catholic-style Bishops and Prayer Books in place of Bible study. During Cromwell’s Protectorate, the Book of Common Prayer was replaced with a Directory of Worship, and bishops were abolished. Cromwell did not favor celebrating feasts of saints, or Christmas. His soldiers often desecrated Churches by removing any signs of what they regarded as ‘Popish’ idolatry, ornaments, statues, or destroying stained-glass depictions of saints. Cromwell's associations of Catholicism and persecution were deepened with the Irish Rebellion of 1641, which were marked by massacres (wildly exaggerated in Puritan circles in Britain) by Irish Catholics of English and Scottish Protestant settlers. This would later be one of the reasons why Cromwell acted so harshly in his military campaign in Ireland. Cromwell was also opposed to the more radical religious groups on the Protestant side in the Civil Wars. Although he co-operated with Quakers and Presbyterians, he was opposed to their authoritarian imposition of their beliefs on other Protestants. He became associated with the ‘Independent’ faction, which argued for religious freedom for all Protestants in a post-war settlement. He favored Congregationalism, which first started in 1581 in Norwich when Robert Browne gathered a congregation of believers together, who he said constituted the true church locally as a voluntary, covenanted community under Christ, not the ruler. Congregations were self-governing, choosing their own pastors and elders. Finally, Cromwell was also a firm believer in Providentialism—the belief that God was actively directing the affairs of the world through the actions of chosen people. He believed himself to be God's instrument and, during the Civil Wars that he interpreted victories as indications of God's approval of his actions and defeats as signs that God was directing him in another direction (see Fraser 2001, 176). However, he also credited his soldiers (701). The leading Puritan thinker and writer, John Bunyan served in his army, while John Milton was his secretary. John Owen, considered the leading Puritan thinker, was his friend and Chaplain. Fraser (2001) cites Milton, who described Cromwell as having stored up a “native vastness of intellect” and his “faith in God” that carried him through life (16). Fraser describes Cromwell's faith of having had “an extraordinary mystical streak” (412). The Oxford historian Christopher Hill has written a semi-popular account of his influential studies in this area in God's Englishman (1970). Having joined the Parliamentary Army with no military experience at the age of 43, he recruited a cavalry unit and gained experience and victories in a succession of battles in East Anglia. He famously recruited his officers based on merit rather than on the basis of noble birth, saying: "I would rather have a plain russet-coated captain who knows what he fights for and loves what he knows than that which you call a gentleman and is nothing else." As a result, the New Model Army under Cromwell's command became a centre for political radicals like the Levellers and a myriad of radical religious sects like the Fifth Monarchists. Cromwell had no formal training in military tactics, but had an instinctive gift for command. He succeeded on several occasions in outmaneuvering Prince Rupert, who was a veteran of European warfare. His army was very disciplined. Profanity and drunkenness were met with fines. His soldiers went into battle singing hymns, including the Psalms of David. Again, this suggests that Cromwell was consciously modeling his army on Biblical lines. On the other hand, Fraser (2001) says that he would also jest and joke with his men, and that when he was among them he was “a larger than life character who naturally embodied their own passions and even their jokes” (176). Cromwell's troops came to respect his bravery and his concern for their well-being. Promoted to general in charge of cavalry for the New Model Army, he trained his men to rapidly regroup after an attack, tactics he first employed with great success at the Battle of Naseby and which showed a very high level of discipline and motivation on the part of his troops. With successive military victories Cromwell gained political power, until he became the leading politician of the time. By the end of the first civil war in 1646, the King was a prisoner of the Parliament. Cromwell, however, commanded the army that had won this victory and as a result was in a position to dictate the future of England. Cromwell showed in the English Civil Wars that he was a brave and daring cavalry commander. However, in the years to come he would also be recognized as an exceptional commander of whole armies. His successful conquests of Ireland and Scotland showed a great mastery of organizing supplies and logistics for protracted campaigns in hostile territory. The Parliamentarians, including Cromwell, hoped to reach a compromise settlement with Charles I. However, the King would not accept a solution at odds with his own Divine right doctrines. The so-called ‘second civil war,’ which broke out in 1648 after Charles I's escape from prison, suggested to Cromwell that no compromise with the King would be possible. In 1649, after being tried for treason, Charles I was executed by the Rump Parliament at Whitehall. Cromwell came under pressure from the radicals among his own officers to execute the King, whom they termed, "Charles Stuart, that man of blood." Many hold Cromwell responsible for the execution of Charles I in January 1649, although there were 59 signatories to the death warrant. However, Cromwell does hold much of the responsibility, as his troops broke into the Parliament's chambers and only permitted the "regicides" - those in favor of Charles' execution - to vote on the matter. Cromwell did not have long to dwell on the future form of government in England however, as he immediately left the country to crush the remaining Royalist strongholds in Ireland and Scotland. After the 1660 Restoration of the Monarchy under Charles II regicide became a crime that was equated with rebellion against God, and was incorporated into the 1662 Book of Common Prayer, which marks the murder of the King as martyr with a solemn feast on January 30. 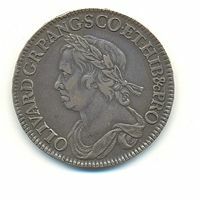 Half-Crown coin of Oliver Cromwell, 1658. The inscription reads OLIVAR.D.G.RP.ANG.SCO.ET.HIB.&.PRO (OLIVARUS DEI GRATIA RES PUBLICA ANGLIAE, SCOTIAE ET HIBERNIAE, ETC, PROTECTOR), meaning "Oliver, by the Grace of God, of the Commonwealth of England, Scotland and Ireland, etc, Protector. The "etc" refers to the residual claim of England to the throne of France, which even the republican Cromwell was not prepared to renounce. Cromwell's actions made him very unpopular in Scotland and Ireland which, as previously independent nations, were effectively conquered by English forces during the civil wars. In particular, Cromwell's brutal suppression of the Royalists in Ireland during 1649 still has a strong resonance for many Irish people. The most enduring symbol of this brutality is the siege of Drogheda in September 1649. The massacre of nearly 3,500 people in Drogheda after its capture—comprising around 2,700 Royalist soldiers and all the men in the town carrying arms, including some civilians, prisoners, and Catholic priests—is one of the historical memories that has fuelled Irish-English and Catholic-Protestant strife for over three centuries. The extent of Cromwell's intentions has been strongly debated. For example, it is clear that Cromwell saw the Irish in general as enemies—he justified his sack of Drogheda as revenge for the massacres of Protestant settlers in Ulster in the Irish Rebellion of 1641 calling the massacre, "The righteous judgment of God on these barbarous wretches, who have imbued their hands with so much innocent blood" —and the records of many churches such as Kilkenny Cathedral accuse Cromwell's army of having defaced and desecrated the churches and having stabled the horses in them. On the other hand, it is also clear that on entering Ireland he demanded that no supplies were to be seized from the inhabitants and that everything should be fairly purchased. It has been claimed 1 that his actual orders at Drogheda followed military protocol of the day, where a town or garrison was first given the option to surrender and receive just treatment and the protection of the invading force. The refusal to do this even after the walls had been breached meant that Cromwell's orders to show no mercy in the treatment of men of arms was inevitable by the standards of the day. This view has been disputed by historians 2. Cromwell's men committed another infamous massacre at Wexford, when they broke into the town during surrender negotiations and killed over 2,000 Irish soldiers and civilians. These two atrocities, while horrifying in their own right, were not exceptional in the war in Ireland since its start in 1641, but are well remembered—even today—because of a concerted propaganda campaign by the Royalists, which portrayed Cromwell as a monster who indiscriminately slaughtered civilians wherever he went. However, Cromwell himself never accepted that he was responsible for the killing of civilians in Ireland, claiming that he had acted harshly, but only against those "in arms.” In fact, the worst atrocities committed in that country, such as mass evictions, killings and deportation for slave labor to Barbados, were carried out by Cromwell's subordinates after he had left for England. In the wake of the Cromwellian conquest, all Catholic-owned land was confiscated in the Act of Settlement 1652, the practice of Roman Catholicism was banned, and bounties were offered for priests. Regardless, Ireland remained a Roman Catholic nation as most Irish Catholics refused to abandon their faith. Cromwell also invaded Scotland in 1650-1651, after the Scots had crowned Charles I's son as Charles II and tried to re-impose the monarchy on England. Cromwell had been prepared to tolerate an independent Scotland, but had to react after the Scots invaded England. Cromwell was much less hostile to Scottish Presbyterians than to Irish Catholics, seeing them as, "His [God's] people, though deceived". Nevertheless, he acted with ruthlessness in Scotland. Despite being outnumbered, his veteran troops smashed Scottish armies at the battles Dunbar (1650) and of Worcester and occupied the country. Cromwell treated the thousands of prisoners of war he took in this campaign very badly, allowing thousands of them to die of disease and deporting others to penal colonies in Barbados. 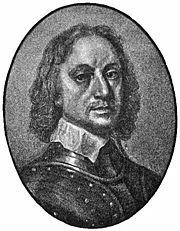 Cromwell's men, under George Monck, viciously sacked the town of Dundee, in the manner of Drogheda. During the Commonwealth, Scotland was ruled from England and kept under military occupation, with a line of fortifications sealing off the Scottish Highlands from the rest of the country. Presbyterianism was allowed to be practiced as before, but its Kirk did not have the backing of the civil courts to impose its rulings, as previously. In both Scotland and Ireland, Cromwell is remembered as a remorseless and ruthless enemy. 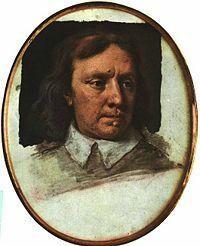 However, the reason for the peculiar bitterness that the Irish especially traditionally held for Cromwell's memory has much to do with his mass transfer of Catholic-owned property into the hands of his soldiers as with his wartime actions. In the wake of the Army's 1648 recapture of the King, the monarchy was abolished, and between 1649 and 1653 the country became a republic, a rarity in Europe at that time. The republic was known as the Commonwealth of England. The concept of 'Commonwealth' would subsequently be used in several American states. Many of Cromwell's actions upon gaining power were decried by some commentators as harsh, unwise, and tyrannical. He was often ruthless in putting down the |mutinies which occurred within his own army towards the end of the war (which were sometimes prompted by failure to pay the troops). He showed little sympathy for the Levellers, an egalitarian movement which had contributed greatly to Parliament's cause. (The Leveller point of view had been strongly represented in the Putney Debates held between the various factions of the Army in 1647, just prior to the King's escape. However, many historians, including those on the left, have conceded that the Leveller viewpoint, though attractive to a modern audience, was too far ahead of its time to be a stable basis for government). Cromwell was not prepared to countenance a radical democracy, but as events were to show, could not engineer a stable oligarchic Parliamentary republic either. With the king gone (and with him their common cause), Cromwell's unanimous backing dissolved, and the various factions in Parliament became engaged in infighting. In a repeat of the actions the former king had taken that had contributed to civil war, Cromwell eventually dismissed the republican Rump Parliament in 1653 and instead took personal control, effectively, as military dictator. He was disillusioned that Parliament, consisting of landed gentry, ruled in its own interests, not in those of the people and it has to be said that the idea of universal adult suffrage was not at the time on anyone's mind. Cromwell's power was buttressed by his continuing popularity among the army which he had built up during the civil wars. He also, says Fraser (2001), “knew men”—and so was well served by his choice of aids, officers and advisors including former Royalists (702). Cromwell's absolute insistence on religious freedom, for all except Roman Catholics, led to his encouraging Jews to return to England, 350 years after their banishment by Edward I. This can now be seen as one of his most important achievements . A consequence of this was the establishment of the British mandate in Palestine after World War I, which was favored by Zionists themselves, who commented that Britain was “definitely associated with Zionism in the minds of the Jews” . In 1657 Cromwell was offered the crown by a reconstituted parliament, presenting him with a dilemma since he had been instrumental in abolishing the monarchy. After six weeks of deliberation, he rejected the offer, largely because the senior officers in his army threatened to resign if he accepted, but also because it could have placed existing constitutional constraints on his rule. Instead, he was ceremonially installed as Lord Protector at Westminster Abbey, sitting on the former king's throne. The event was practically a coronation and made him king in all but name. The written constitution even gave him the right to issue Royal and noble titles, a device that he soon put to use in much the same fashion as former kings. Cromwell suffered from malaria and from ‘stone,’ a common term for urinary/kidney infections, yet he was in generally good health. He was struck by a sudden bout of malaria, followed directly by an attack of urinary/kidney symptoms. Although weakened, he was optimistic about the future as were his attendants. A Venetian diplomat, also a physician, was visiting at the time and tracked Cromwell's final illness. It was his opinion that The Lord Protector's personal physicians were mismanaging his health, leading to a rapid decline and death. Within two years of Cromwell's death on September 3, 1658, parliament restored Charles II as king, as Cromwell's son Richard Cromwell had proved an unworthy successor. Maligned as a hypocrite who used religion to further his ambitions, Cromwell has been defended and criticized in turn by successive generations. Fraser (2001) says that he could be blinded by his own sense of righteousness, and that in “seeking to bring about change - peace through war - as his Latin motto had it - he displayed indeed a remarkable freedom from daunt” (703). He passionately believed that the “lives of ordinary people should be improved, not brutalized by the deeds of the powers that ruled them” (702). The “feeling spread by his eulogists,” Lady Fraser concludes, “that he had been called out of a private station to his country's service” is a case that can still be made (703). He loved England, she says: “the English countryside, English field sports, horses, dogs, hunting and hawking, all of which not only marked him as a rounded man, but also brought him closely in touch with many of the people over whom he ruled, because he shared their tastes” (701). 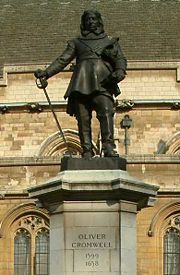 This would have been the end of the story, but in 1661 Oliver Cromwell's body was exhumed from Westminster Abbey and was subjected to the ritual of a posthumous execution—on January 30, the same date that Charles I had been executed. He was in fact hanged, drawn and quartered. At the end his body was thrown into a pit. His severed head was displayed on a pole outside Westminster Abbey until 1685. Since then it changed hands several times before eventually being buried in the grounds of Sidney Sussex College, Cambridge, in 1960. Unusually, in Cambridge, he is commemorated in a painted glass window in Emmanuel United Reformed Church, and St. Ives, Cambridgeshire, has a statue of him in the town center. John Milton called Cromwell “Our Chiefest Man,” and wrote that, “guided by faith and matchless fortitude [he had] ploughed [God's] glorious way [to] peace and truth” (http://www.ianpaisley.org/article.asp?ArtKey=cromwell). In 2003, Cromwell was ranked tenth in a popular BBC poll of "100 Greatest Britons." Cromwell was (likely in absence) called Copper Nose, for a brownish tinge on his nose. In 1989, Monty Python wrote a song called "Oliver Cromwell," which told the entire career of Cromwell to the tune of Frederic Chopin's Polonaise Op.53 in A flat major. It is available on their compilation album, Monty Python Sings. This page was last modified on 19 December 2018, at 16:37.